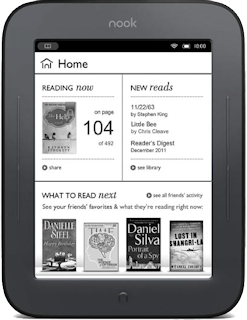 Barnes & Noble created five eBook readers similar to the Amazon Kindle. It could also be looked on as a miniature iPad. 2GB Holds up to 1,000 books. diagonal: 15.2 cm, 6.00 inches, width × height 600 × 800 pixels, 9.1 × 12.2 cm, (3.60 × 4.80 inches) touchscreen. 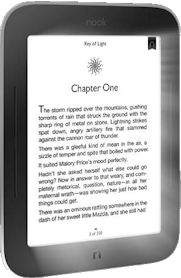 Display is 25% faster than any other eReader. Top-rated display readability, even in bright sun. Crisp black and white e-Ink. 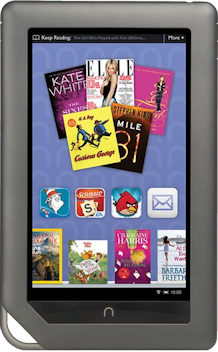 2.5+ million books in Nook format. Borrow books from your public library. Supports non-proprietary formats such PDF (Portable Document Format). ePub (Electronic Publishing), PDF, PDB (Project DataBase), JPEG (Joint Photographic Experts Group), PNG (Portable Network Graphics), BMP (Bitmap). You can share books for 14 days with friends. 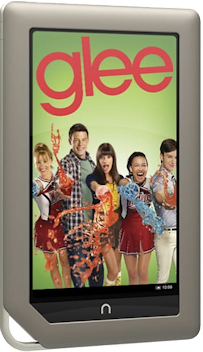 New York Times picked it as the best e-reader. You are paying $60 extra just for a night light. 8 GB holds up to 5,000 books. Runs Android apps and games. Comes in white(snow) or black(smoke). 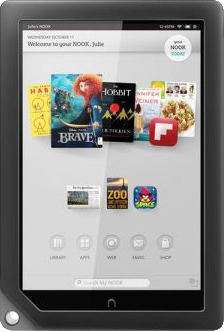 Nook has another line of eBooks called Nook Study. You do not need a reader, just a computer. You install reader software. You can download text books free and use them for a week. To continue using them, you must pay.